Orestes killed his mother, but Pentheus’ mother killed him. 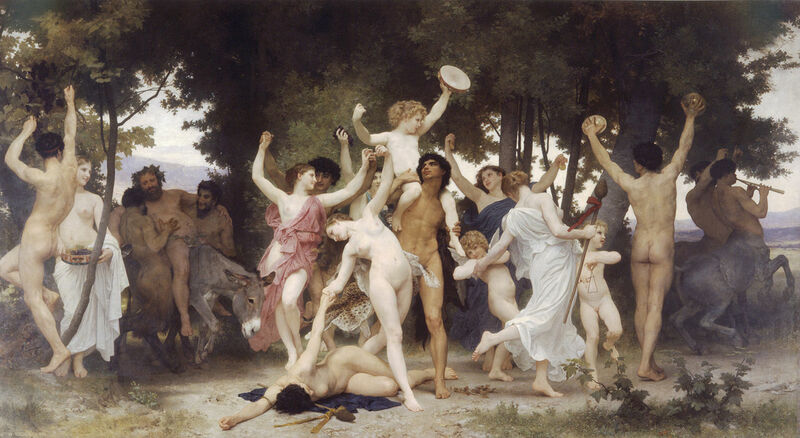 Dionysus drove the women of Thebes mad because they hadn’t respected him. His cousin, the adolescent King Pentheus, tried to imprison him and defeat the mad women, who were led by Pentheus’ mother Agave and his two aunts. In his rigidly masculine stance, the king was blind to the fact that a god (or, if you prefer, an unacknowledged part of himself) stood before him. Eventually Dionysus drove him mad as well; and the crazed women, thinking he was an animal, killed him. The Bacchae by Euripides is the most troubling of all tragic plays, because it involves the horrifying imagery of a mother tearing her son’s body apart, at the instigation of a god. Pentheus is already king when The Bacchae opens, yet his rule is inflexible, authoritarian and barely legitimate. Things begin to fall apart as soon as Pentheus appears and confronts Dionysus. He is almost literally begging for trouble – or initiation – from this god of madness. Dionysus offers him opportunities to realize his errors, but Pentheus pursues his dangerous course until he reaches the point of no return. Eventually, after the gruesome murder, Agave returns to Thebes with Pentheus’ severed head, realizes her error and collapses into grief. The House of Thebes has fallen. Many commentators on The Bacchae fail to notice a subtle distinction. The God of wine can bring either joy or destruction, depending on how he is received. The band of women who have accepted him and follow him everywhere – the Bacchants – are mad with ecstasy. But the other women in this story are the Maenads. They include Agave and her sisters, and they have succumbed to the madness caused by their mutual repression of Dionysus. We can never know Euripides’ intentions. 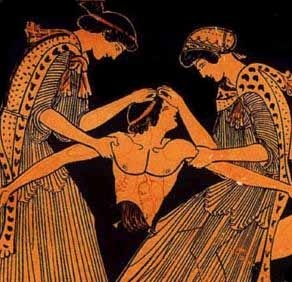 However, in the image of the dismembered Pentheus, the play evokes the archetypal necessity of initiation. Standing back from Judeo-Christian morality, we see that The Bacchae is about neither punishment of evil nor redemption of a soul. It is concerned with the consequences of willful innocence. Pentheus isn’t evil, and Dionysus isn’t good in any conventional sense. Pentheus is, however, profoundly ignorant of his own motivations. As an ephebe – a boy on the cusp of manhood – thrust into the role of king, he has not experienced the mixed curse and blessing of having suffered into wisdom. Come, Father. We must restore his head to this unhappy boy. As best we can, we shall make him whole again. Are they making him “whole again” so as to bury him properly, and/or has Pentheus returned from his psychological dismemberment – the experience universally described by shamans – as a whole person? Most scholars believe the scene expresses the tragedy of the boy-king who is literally destroyed by the god. …famous prize of grief… fold your child in your arms, streaming with his blood! It is horrifying yet absolutely appropriate imagery. Perhaps the scene was intended to induce in its audience an experience of symbolic death, so that they might avoid a more literal one. At the very least, it warned that such a shift was necessary for both individual men – and for imperial Athens. Alone with the memory of their dead. But once Dionysus – known as “the Loosener” – has broken down the walls of the middle-aged, heroic ego, new voices may speak: I know who I am. Or they may announce something different – I am not who I thought I was – I am we, or even the ultimate statement of compassion: I am you.